Chemical Cleaner to remove uncured black waterfall foam from surfaces (including hands and fingers). PRO Gun Cleaner is a proprietary solution to simplify cleanup of uncured polyurethane foam from dispensing guns and work areas. Cured foam must be mechanically removed or allowed to wear off in time. Dissolves & removes uncured polyurethane foam. 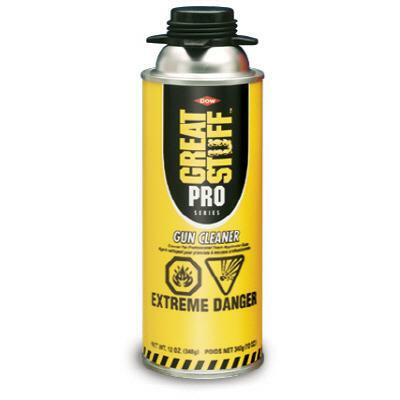 Also works with GREAT STUFF™ Pro foam applicator tools and guns. Cleans uncured foam from the surface of any foam applicator gun. 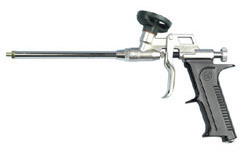 Attaches to applicator gun to clean inside of gun or works with spray nozzle to clean outside of gun or uncured foam. Inexpensive & Easy to use! Click on "View Enlarged Image" under main photo to view instructions for use.